* This is my article in BusinessWorld last June 09, 2017. Despite various protectionist rhetoric by many world leaders against free trade, deep inside they know that there are “net gains” from trade and there are “net losses” under protectionism and restricted trade. Thus, while the multilateral trading agreement under the World Trade Organization (WTO) is not moving significantly, bilateral and regional free trade agreements (FTAs) are everywhere. 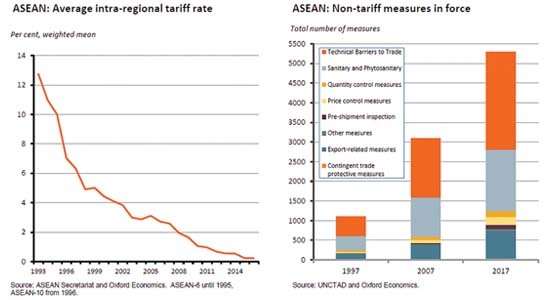 Trade within the Association of Southeast Asian Nations (ASEAN) is among the most dynamic in the world because of their consensus on faster unilateral trade liberalization policy and near zero tariff for all 10 member-countries since 2016. The region of some 630 million consumers would naturally attract the attention of its neighbors that want to source many of their needs and imports and want to export many of their products and services. Thus, the ASEAN + 6 (Japan, China, South Korea, India, Australia, New Zealand) evolved and later these 16 countries moved towards creating the world’s biggest FTA covering half of the planet’s total population + the Regional Comprehensive Economic Partnership (RCEP). Plenty of negotiations still ongoing but member-countries are hoping that RCEP will be formalized within the next two years. The main thorn in the agreement is not on tariffs but on non-tariff barriers (NTBs) or non-tariff measures (NTMs). Last May 8, Stratbase-Albert del Rosario Institute (ADRi) organized a small group economists’ roundtable discussion on the “Global Geopolitical Situation: its Impact on Australian and Philippine Economies” at the Manila Peninsula Hotel. The main speaker was Mark Thirlwell, chief economist of Australia Trade and Investment Commission (Austrade). It was a good forum with lots of useful data and insights. Among Mark’s points were the following: (a) Global tariffs are still low but have stopped falling, (b) Free Trade Agreement (FTA) coverage has grown but may have plateaued, (c) Non-tariff barriers are rising, including temporary barriers like anti-dumping, countervailing duties and safeguards, (d) trade liberalizing measures are surpassed or outnumbered by discriminatory/protectionist measures, and (e) ASEAN countries fit this global pattern as shown in these two very clear charts. During the ASEAN Summit in Manila, Malaysian PM Najib Razak reemphasized the need to reduce the NTBs or non-tariff measures (NTMs) in the region, which have surged from 1,634 in 2000 to 5,975 in 2015. Mark also said that e-commerce is also enabling trade citing the role of eBay, Amazon, and he asked if the world has already attained “peak trade” as global trade/GDP ratio has somehow plateaued at around 63% over the past few years. I argued during the open forum that like “peak food” (formulated by Thomas Malthus and later by Paul Ehrlich, others) and “peak oil” (formulated in the ’70s, reformulated in the ’90s), “peak trade” will not happen. The average merchandise exports/GDP ratio from 2010-2015 of these Asian economies are as follows: Hong Kong 352.2%, Singapore 260.7%; Vietnam 152.7%; Malaysia 134.7%; Taiwan 114.6%; Thailand 113.6%. Yearly data I got from the ADB’s Key Indicators, November 2016 report. These are exports of goods alone. If exports of services are included, the ratio will grow much higher. ASEAN countries should proceed with further trade liberalization and reduce the number of NTBs/NTMs at least among themselves. 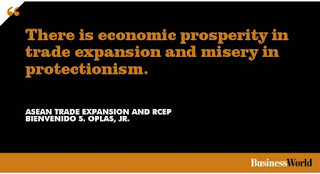 There is economic prosperity in trade expansion and misery in protectionism.